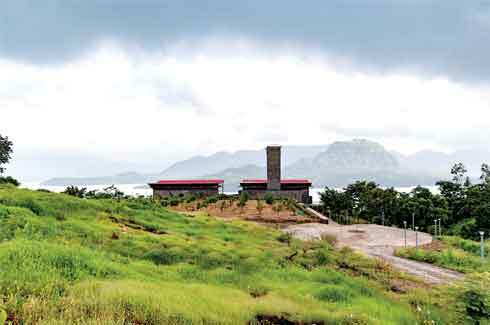 The Mulshi Lake House has been ingeniously designed by Pune-based Navkar Architects to both ape and adapt to the natural topography of the hills. Rain or no rain, Mulshi at a distance of a mere 45 kms from Pune, is a magical place and it ups its game exponentially the moment monsoon arrives. As author Alice Munro mentions in her short story, Chance, “the hills here look like a stage curtain, coming and disappearing from view as the clouds move with the winds.” This described coastal Canada but it could well have been about Mulshi. The green hills and the eponymous lake of the location have of late been groaning under the typical unsavoury outfalls of local tourism, primarily garbage, but there are still quite a few pristine pockets left. 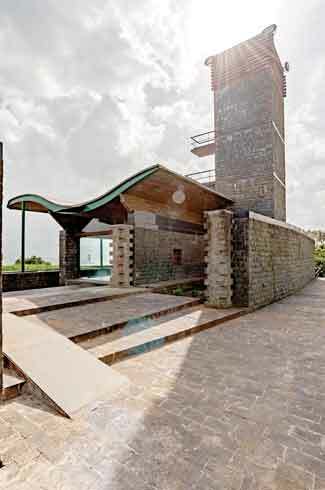 The Mulshi Lake House, designed and realised by Pune-based Navkar Architects led by architect Girish Doshi, is located at just such a clean and lovely site close to the lake. 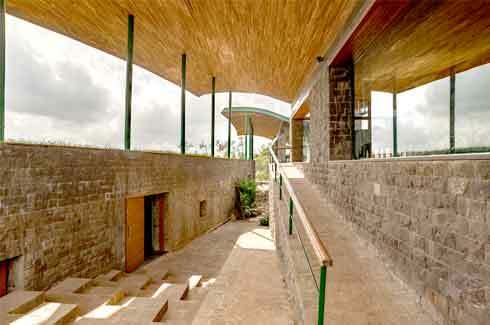 The look of the project – sprawling, fresh, and earthy – is only the most obvious feature of this building. 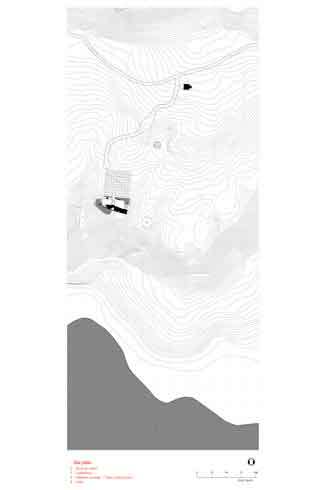 The real brilliance of its design is in fact fulcrumed around its chosen topographical spot and the way it has been manoeuvred around it. The lake house stands down-slope from a road and uphill of sorts from the lake. This main structure then faces up to all the wonders of the beauteous lake; its walls separated by another segment of a relatively steeper hill. Now for the main structure itself. It is composed of what are three essentially parallel walls, only with their staid countenance forever altered into serpentine forms by the uneven terrain. The first main wall from the road down is almost concave as a result. 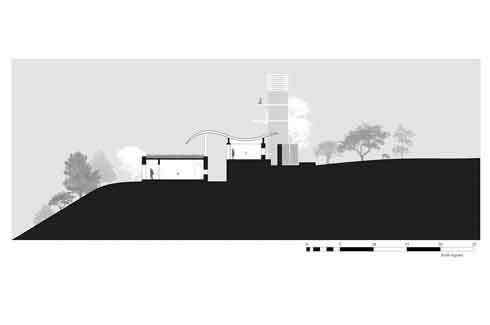 The most pronounced tilt is effected by the middle wall, which stands in homage to the flat-and-then-downhill-slide of the hill-scape. The third wall, facing the lake directly, forms just a minor tilt before tapering and flattening out on the side.This layout, with its deceptive but fantastic grace, creates a fortress like solidity. “The house is as strong as nature,” attests the team. Indeed, the walls are mighty creatures, reinforced and propped by wood, stone, and metal. 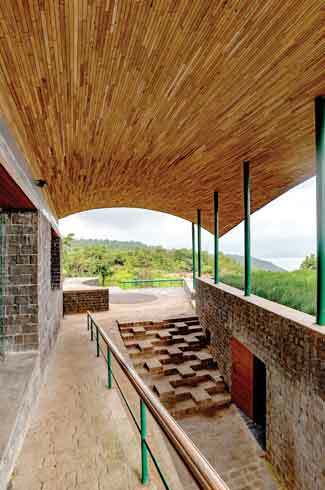 The curvature of the roof helps slide off any excess of the monsoon largesse while at the same time forming minor mirror images of the cascades that dot the Mulshi hill and are its greatest visual delights. This arrangement also builds two elongated stretches of interior space. 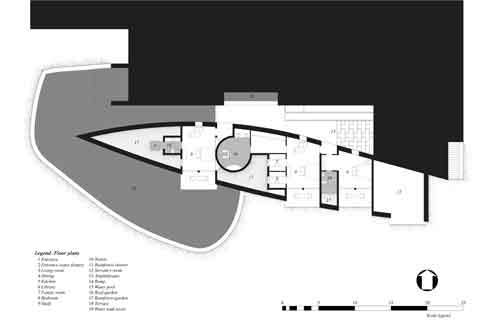 The formal segment with another entrance is the living room, and then the private mass that houses the bedrooms and the kitchen. The interiors here assert the idea that this is not a home where you shut yourself in, but rather one where you soak in nature endlessly. 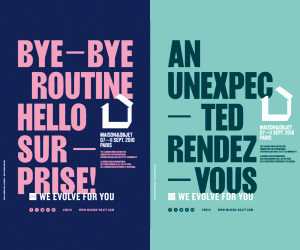 Outside, the need for colour was understandably never felt, so it is all stone walkways, stone steps and stone pillars, aside from the semi-open reading/napping/seating/entertainment segments. The views of the green slopes, placid waters and moody clouds are sweeping and inescapable. Blame it on this feature that the closed-off sections of the house look almost cavernous in comparison! So to cheer up the mood, the walls inside are canary yellow in parts, looking startlingly bold in a landscape of broody greys. 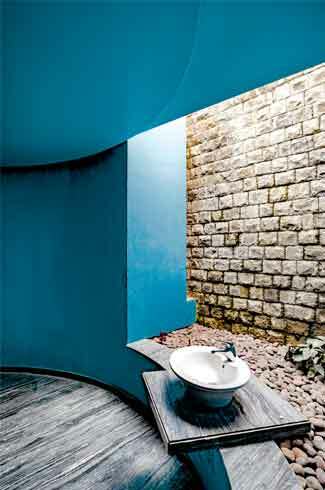 The bathroom walls are decked in a handsome shade of blue, looking smooth against the pebbled path and stone wall that a glass wall offers views of. 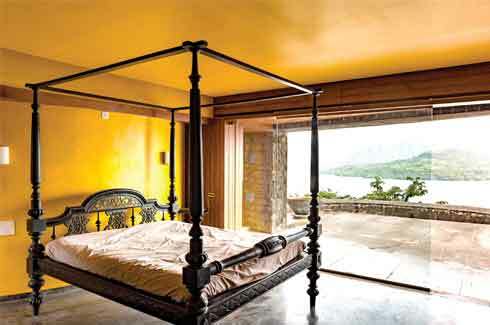 It is interesting how the Mulshi Lake House has all the elements of a typical home, yet is so off the conventional road that it demands to be viewed and understood as a different entity altogether. 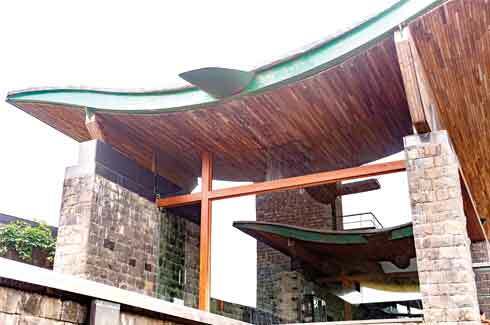 Both its tenor and structure perfectly complement the wild greenery around, and the team deserves credit for not going overboard and building something incongruous in the midst of such loveliness of nature.